OMAHA, NEBRASKA (July 1, 2016) Coming back from a preliminary disqualification that was later overturned, Cammile Adams punched her ticket to Rio de Janeiro and the Games of the 31st Olympiad by winning the 200-meter butterfly at the U.S. Olympic Swimming Trials in Omaha, Nebraska on Thursday, June 30, 2016. The 24-year old Houston area native battled back from seventh place after the first 50 meters to third place at the halfway point in the race. She powered a 32.48 second, third leg of the race to take the lead of which she did not yield and as a result, won the event and a trip to Brazil. 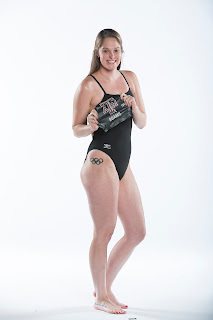 Adams, who swam collegiately for Texas A&M University, posted the time of 2:06.80 to earn her second trip to the Olympic Games. At the 2012 London Olympics, she placed fifth in the event with the time of 2:06.76. In her preliminary heat in Omaha, Adams swam a comfortable 2:08.29 to lead the field after her reinstatement from the previous disqualification on Wednesday morning. In the semifinal later that evening, she improved her time to 2:07.31 to again lead the field. Her time of 2:06.80 in the finals on Thursday ranks seventh in the world in the event in 2016, behind top ranked Madeline Groves. Groves time of 2:05.47, which came at the 2016 Australian Championship, currently leads the world in 2016. The current world record is held by China’s Zige Liu with the time of 2:01.81 set on October 21, 2009. Also earning a berth to the Rio Olympics in the 200-meter butterfly was Hali Flickinger. The 21-year old made her first Olympic team with the time of 2:07.50 and a second place finish. The Olympic Games in Rio begin on August 5 with the women’s 200-meter butterfly preliminary and semi-final heats on Tuesday, August 9. The final is scheduled for the evening of Wednesday, August 10.